(a) Transverse section through the posterior abdominal cavity including the kidneys, which are located behind the parietal peritoneum. Adipose and other connective tissues surround and support the kidneys. (b) Sagittal section through the posterior abdominal cavity showing the kidney. About two in every ten patients with renal failure can use a procedure that can be done at home called continuous ambulatory peritoneal dialysis instead of hemodialysis. The patient infuses a solution into the abdominal cavity through a permanently implanted tube. The solution stays in for four to eight hours, while it takes up substances that would normally be excreted into urine. Then the patient drains the waste-laden solution out of the tube, replacing it with clean fluid. Infection is a risk associated with this procedure. U Where are the kidneys located? ^9 Describe the structure of a kidney. ^9 Name the functional unit of the kidney. 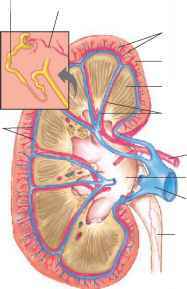 □ What are the general functions of the kidneys? 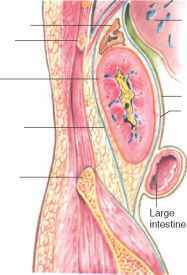 The renal arteries, which arise from the abdominal aorta, supply blood to the kidneys (see fig. 20.5). These arteries transport a large volume of blood. When a person is at rest, the renal arteries usually carry from 15% to 30% of the total cardiac output into the kidneys, although the kidneys account for only 1% of body weight. (a) A single nephron. (b) A renal pyramid containing nephrons. (c) Longitudinal section of a kidney. A renal artery enters a kidney through the hilum and gives off several branches, called the interlobar arteries, which pass between the renal pyramids. At the junction between the medulla and the cortex, the interlobar arteries branch to form a series of incomplete arches, the arcuate arteries (arciform arteries), which, in turn, give rise to interlobular arteries. The final branches of the interlobular arteries, called afferent arterioles (af'er-ent ar-te're-olz), lead to the nephrons, the functional units of the kidneys. Charles B., a forty-three-year-old muscular construction worker, had been feeling unusually tired for several weeks, with occasional dizziness and difficulty sleeping. 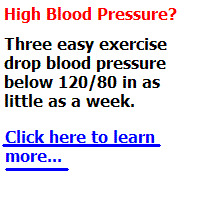 More recently he had noticed a burning pain in his lower back, just below his rib cage, and his urine had darkened. In addition, his feet, ankles, and face seemed swollen. His wife suggested that he consult their family physician about these symptoms. The physician found that Charles had elevated blood pressure (hypertension) and that the regions of his kidneys were sensitive to pressure. A urinalysis revealed excess protein (proteinuria) and blood (hematuria). 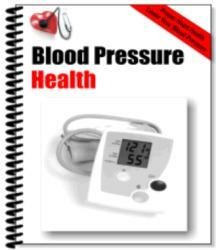 Blood tests indicated elevated blood urea nitrogen (BUN), elevated serum creatinine, and decreased serum protein (hypopro-teinemia) concentrations. The physician told Charles that he probably had chronic glomerulonephritis, an inflammation of the capillaries within the glomeruli of the renal nephrons, and that this was an untreatable progressive degenerative disease. Microscopic examination of a small sample of kidney tissue (biopsy) later confirmed the diagnosis. In spite of medical treatment and careful attention to his diet, Charles's condition deteriorated rapidly. 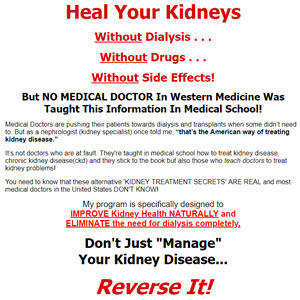 When it appeared that most of his kidney function had been lost (end-stage renal disease, or ESRD), he was offered artificial kidney treatments (hemodialysis). To prepare Charles for hemodialysis, a vascular surgeon created a fistula in his left forearm by surgically connecting an artery to a vein. The greater pressure of the blood in the artery that now flowed directly into the vein swelled the vein, making it more accessible. During hemodialysis treatment, a hollow needle was inserted into the vein of the fistula near its arterial connection. This allowed the blood to flow, with the aid of a blood pump, through a tube leading to the blood compartment of a dialysis machine. Within this compartment, the blood passed over a selectively permeable membrane. On the opposite side of the membrane was a dialysate solution with a controlled composition. Negative pressure on the dialysate side of the membrane, created by a vacuum pump, increased the movement of fluid through the membrane. At the same time, waste and excess electrolytes diffused from the blood through the membrane and entered the dialysate solution. The blood was then returned through a tube to the vein of the fistula. In order to maintain favorable blood concentrations of waste, electrolytes, and water, Charles had to undergo hemodialysis three times per week, with each treatment lasting three to four hours. During the treatments, he was given an anticoagulant to prevent blood clotting, an antibiotic drug to control infections, and an antihypertensive drug to reduce his blood pressure. Charles was advised to carefully control his intake of water, sodium, potassium, proteins, and total calories between treatments. He was also asked to consider another option for the treatment of ESRD — a kidney transplant — which could free him from the time-consuming dependence on hemodialysis. 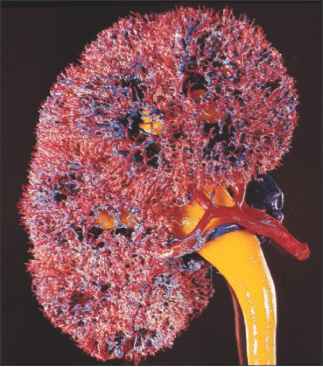 Blood vessels associated with the kidneys and adrenal glands. Note their relationship with the renal pelvis and ureters. 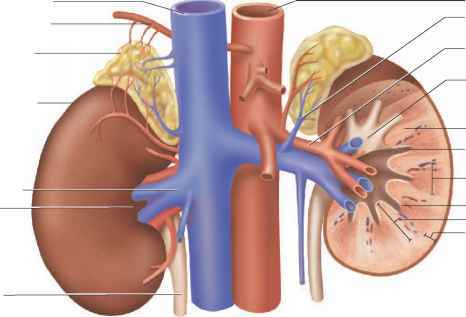 Each kidney contains about one million functional units called nephrons (nefronz). 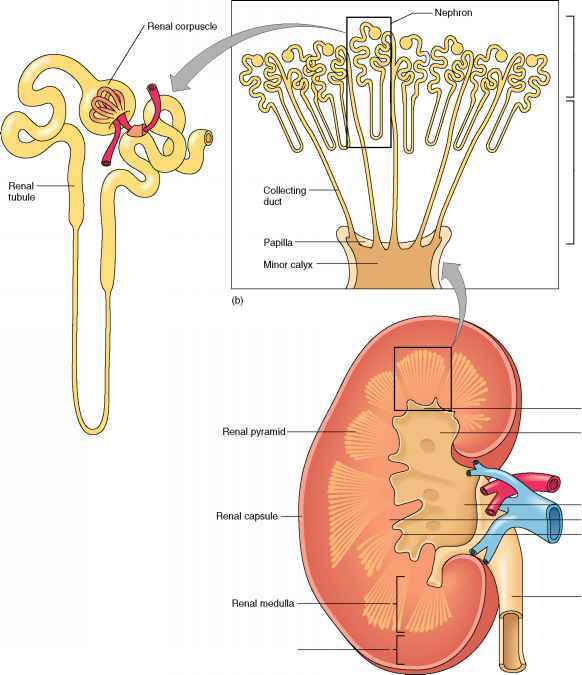 Each nephron consists of a renal corpuscle (re'nal kor'pusl) and a renal tubule (re'nal tu'bul) (see fig. 20.4). A renal corpuscle consists of a filtering unit composed of a tangled cluster of blood capillaries called a glomerulus (glo-mer'u-lus) and a surrounding thin-walled, saclike structure called a glomerular (Bowman's) capsule. 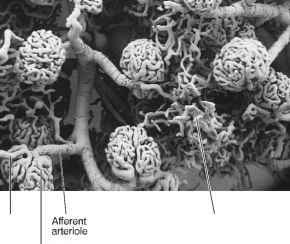 Afferent arterioles give rise to these capillaries, which lead to efferent arterioles (ef'er-ent ar-te're-olz) (fig. 20.7). Filtration of fluid from the glomerular capillaries is the first step in urine formation. The glomerular capsule is an expansion at the end of a renal tubule that receives the fluid filtered at the glomeru-lus. 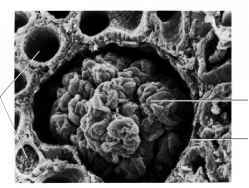 It is composed of two layers of squamous epithelial cells: a visceral layer that closely covers the glomerulus and an outer parietal layer that is continuous with the visceral layer and with the wall of the renal tubule (see fig. 20.15). The cells of the parietal layer are typical squamous epithelial cells; however, those of the visceral layer are highly modified epithelial cells called podocytes. Each podocyte has several primary processes extending from its cell body, and these processes, in turn, bear numerous secondary processes, or pedicels. The pedicels of each cell interdigitate with those of adjacent podocytes, and the clefts between them form a complicated system of slit pores (fig. 20.8). The renal tubule leads away from the glomerular capsule and becomes highly coiled. This coiled portion of the tubule is the proximal convoluted tubule. Following the proximal convoluted tubule is the nephron loop (loop of Henle). The proximal convoluted tubule dips toward the renal pelvis to become the descending limb of the nephron loop. The tubule then curves back toward its renal corpuscle and forms the ascending limb of the nephron loop. The ascending limb returns to the region of the renal corpuscle, where it becomes highly coiled again and is called the distal convoluted tubule. This distal portion is shorter and straighter than the proximal tubule. Several distal convoluted tubules merge in the renal cortex to form a collecting duct (collecting tubule), which is technically not part of the nephron. The collecting duct passes into the renal medulla, widening as it joins other collecting ducts. The resulting tube empties into a minor calyx through an opening in a renal papilla. Figures 20.9 and 20.10 show the parts of a nephron. Clinical Application 20.2 examines glomerulonephritis, an inflammation of the glomeruli. (a) Main branches of the renal artery and vein. (b) Corrosion cast of the renal arterial system. Not all blood vessels associated with the nephron are shown. What blood vessel empties into the interlobular artery is called? What blood vessel follows the interlobar artery?